Larry Bird clearly put his mark on the NBA as a member of the Boston Celtics. His stellar play and head-to-head battles with Magic Johnson helped push the NBA into the forefront and ultimately paved a path for Michael Jordan to emerge as the first true NBA superstar. 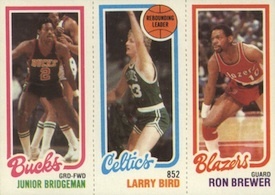 As a result, Larry Bird cards and memorabilia are among the most popular options among retired players. 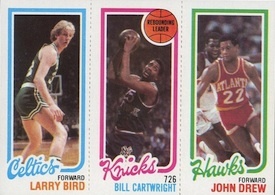 Shop for Larry Bird Cards on eBay. 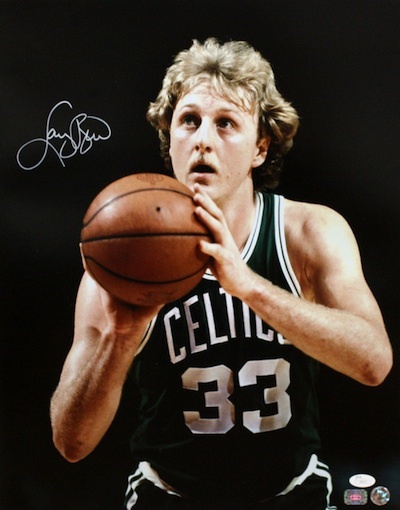 After an impressive three years at Indiana State University, Larry Bird was selected by the Boston Celtics with the sixth overall pick in the 1978 NB Draft. "Larry Legend" enjoyed a successful NBA career that spanned 13 seasons, and included 12 All-Star appearances and three NBA championships, to go along with three regular season MVPs and two Finals MVPs. All issued after his retirement, Larry Bird has a ton of autographed cards available for collectors. 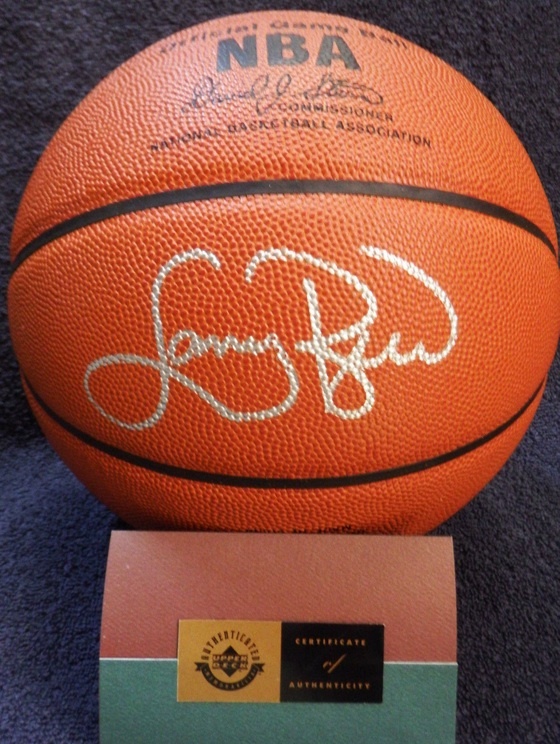 Unlike his cards, Larry Bird autographed memorabilia carries a premium and is not as readily available. 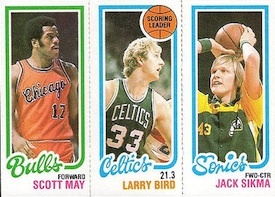 Larry Bird only has one rookie true card for collectors, and he shares the card with two other Hall of Fame players. 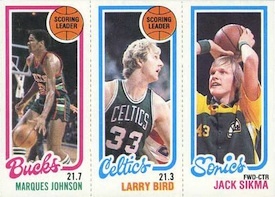 While it would be nice if Larry Bird had his very own rookie card, you could not ask for better company. 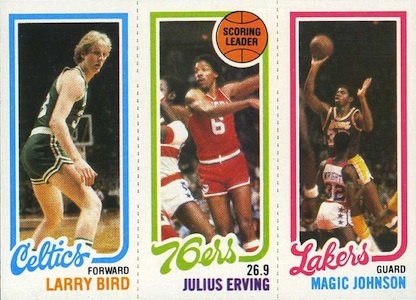 Bird is joined by his biggest on-court competitor, Magic Johnson, and Julius Erving. This is also the only rookie card for Magic Johnson. Few cards in the history of basketball collecting are more important than this special rookie card. 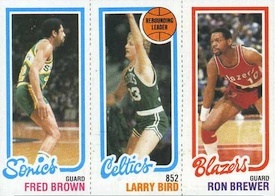 The last card in particular is the most similar to the famed rookie card, as Bird occupies the left spot and the card features the same image of Bird as seen above. All five present an appealing budget option for collectors who cannot afford the main version with Magic and Dr. J. 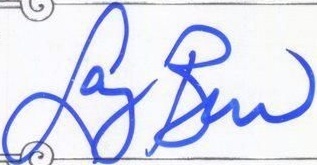 Below you will find an example of what Larry Bird's authentic signature looks like. This can be used as a first point of reference for determining the legitimacy of autograph memorabilia, but is not a substitute for having your items authenticated by a well-respected professional autograph authentication company. Reputable authentication companies include JSA, PSA, Panini Authentic and Mounted Memories, to name a few. 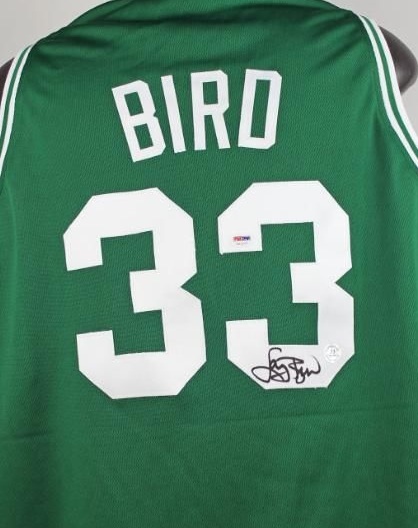 Larry Bird has fairly distinct signature thanks to his looping style. The signature begins with a large cursive "L" that extends over the whole first name. The "a-r-r" is generally distinguishable but can become jumbled together. The "y" is always legible and the bottom loop normally connects back into the letter. The cursive "B" starts the last name and immediately transitions to the remainder of the last name. The "i-r-d" is clearly distinguishable and the "i" is not dotted. The "d" is implied with an upward curving finish.